Champlain Valley & Middlebury 5-Day - NEW! 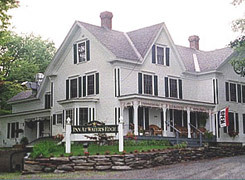 Our Echo Lake Weekend tour is hosted by Bruce & Tina Verdrager at the completely renovated 150 year-old Inn at Water's Edge. Situated at the southern end of Echo Lake, this Victorian style inn has many features for your pleasure such as the private beach, hot tub and an antique English pub imported from London. Of course Tina sees that no one goes hungry as her home-cooked meals will delight and fuel your cycling engine. Saturday, we ride north and then east toward the historic Village of Woodstock. The ride is easy with one fun challenge, the short but steep "Hysteria Hill." Next we arrive at President Calvin Coolidge's birthplace and homestead where he was sworn into office by his father on August 3, 1923. The village remains virtually unchanged since 1923; be sure to visit the general store and cheese factory before continuing toward Woodstock on backroads along the Ottauquechee River passing by the Lincoln Covered Bridge. In Woodstock, guests will want to wander through the Village Green and visit the art galleries, craft and antique shops before a stroll through a lattice covered bridge on their way back to the Inn. Opt for the longer mileage and you will ride to the quaint village of Barnard where you can picnic on the shores of Silver Lake and visit the Barnard General Store. Sunday, we ride toward Proctorsville, Felchville and Ludlow, (home of Okemo Ski Resort), Buttermilk Falls and Peplau's Happy Acres Farm. You will explore Vermont's backcountry roads which will lead you past old cemeteries and beautiful country farms. Your day's ride will be topped with a visit to a working sugar house where we taste the different grades of pure Vermont Maple syrup and homemade jams. For those looking for a challenge, opt for the "Bonus Miles" up and down Terrible Mountain. Available for custom groups of 4 to 6+ guests depending on the tour. Price varies by group size. * denotes a portion of this option is on unpaved roads.